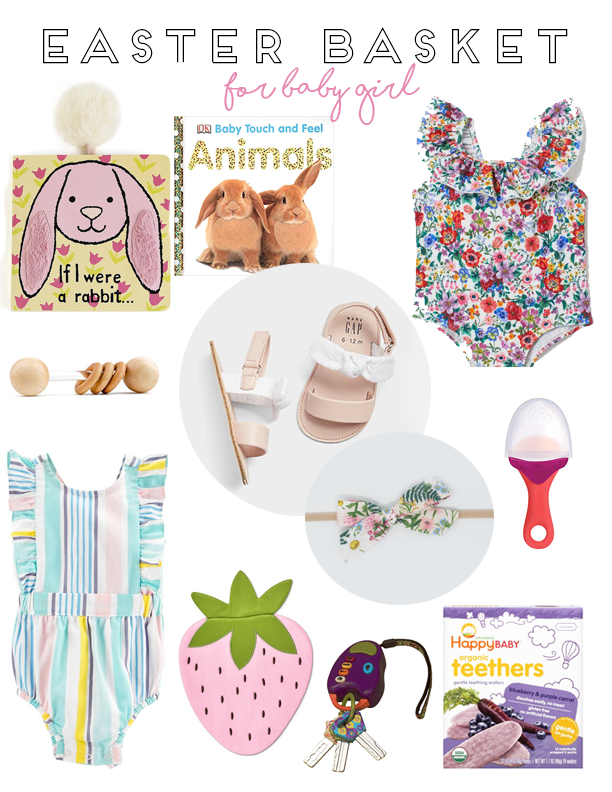 It's Zoe's first Easter so it's only natural I round up my favorite picks for the baby girls in your life! Chase and I love playing the Easter Bunny & always look forward to the special Sunday services followed by egg hunting and lots of family time! This year we are spending Easter with his side of the family which we've never done so we are all super excited about that! We've always gone overboard with Easter as we do Christmas, who else is guilty of that?, but I really do think less is more. I am really trying this year to avoid filling the kids baskets with excessive junk that will get thrown out when we do our next clean out! This year we're pretty much choosing things they need like swimsuits, accessories and shoes, a book, and just one or two toys. We almost always throw in chalk, pens/pencils/markers, and bubbles. What are your favorite things or things you always make sure to put in your babes baskets? I always enjoy seeing what everyone else is planning and saving products for future ideas for birthdays, etc. I hope you all have a fantastic rest of your week and thank you for following along. We are back in the swing of things over here so get excited for new posts!! Love you guys!